Log house to order from the company "Medvezhy Log"
Own house of environmentally friendly materials, which will be built far from the city, interested in the owners of apartments and those who choose this option as the main housing. A log house to order is an opportunity to have a family nest. This is what they always wanted: to choose the number of floors, the layout, the number of rooms, to make a garage and a balcony, a terrace for gatherings in the fresh air. Large kitchen, high ceilings, second light, panoramic windows and other opportunities that can rarely be implemented in a city apartment, suitable for log buildings on request. Even in a relatively small area, rationally using every square meter, you can build a cozy house with all the necessary rooms. We understand clients who are interested in building a high-quality country house, because such a serious decision is made by the majority once in a lifetime. Logs from Canadian and Siberian cedar to order - a cheap option for the price. But such eco-friendly material belongs to the category of elite, houses from it will be durable and reliable. In terms of architecture and layout, the finished result will fully meet your expectations. 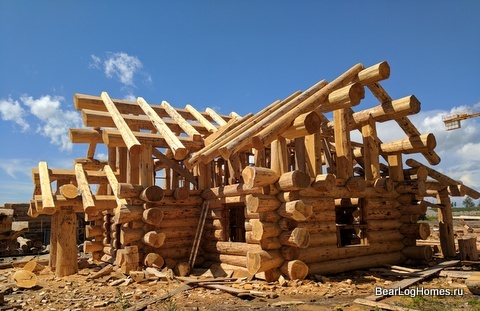 All costs for log buildings under the order at the loyal prices that our company guarantees to our customers will be justified by the external and internal attractiveness of the finished building and its outstanding operational characteristics. Cedar will perfectly preserve heat, create noise insulation. Insects do not threaten the wood, because it contains many essential oils. Easy processing and strength of the cedar simplify the process of building and translating original ideas into reality. The material does not rot even in a climate with high humidity. Wealth of textures and shades of cedar wood. If the standard projects are not for you, you can always order a frame on an individual project, over which the team of professionals of the company "Bear Log" will work. We take into account the latest trends, the wishes of the Customer, try to apply the most practical solutions that will improve the comfort of the client's living even after years. You can choose the size of logs, felling technology, interior decoration. Your housing will not only be convenient, reliable, but also unique. Call + 79029966727 for clarification of cost or fill in application for the calculation of logs.